In the end of November, 2005 dozens women farmers from the village Phalinda, near Theri, stopped the construction of a dam by occupying the bulldozers. The government sent about 200 police officers, beat the villagers, arrested 29 villagers and put them in jail. When the administration didn’t release them, the village planned a demonstration. But the police forbad it, threatening to arrest everyone. 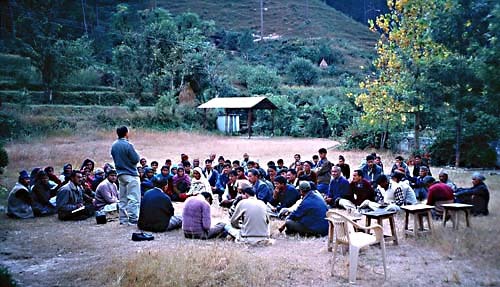 Then the villagers organised a protest meeting to discuss their problems and write a petition to the Chief Minister (= Prime Minister of the state). Their first complaint is about the crude behavior of the police officers against the village women. The policemen are camping in the village and harassing the women. The main problem is the construction of a 15 feet (2.50 m) high dam. The dam will form an artificial lake where a tunnel will start to bring the water to a power station. About 900 workers from outside will stay for three years in this small village and outnumber the genuine habitants completely. The villagers are afraid the workers will make a lot of problems in their village by drinking alcohol and polluting the area. From other projects in the neighbourhood the villagers know the big trucks will bring a lot of noise, dust and traffic accidents. They also know the contractor will throw the debris of the tunnel wherever it is convenient for him, without any discussion. Moreover: the project will bring (almost) no employment for them, because the contractor prefers migrant workers. 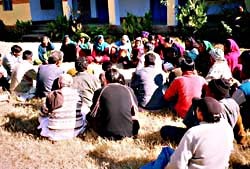 People of the development organisation HPSS have good contacts in the village. They contacted directly the district administration to free the arrested farmers. They helped the villagers with writing the petition. And they called the media. 15 other organisations sent faxes to the district administration and the Chief Minister. The villagers were released after five days.